I explore, experiment, follow my own process, listen to my inner voice, wrestle in obedience to my materials, install the residue, only to discover I speak the same language as those that came before. BUT, another one of my BIG BUTS, I have to choose to do nothing as I am stymied by the need to be original or I can just keep making the work that I am compelled to make and continue to try to push it a new directions. So I get my exhibition installed and SNAP, I see dead people (well not quite dead but those who have been working 50 years or so longer than I). Darn. Didn’t fully see it as I worked, but slap it on a white wall and there it is! I have fallen into a void where there is no individuality, no unique private world, no authorship or originality. I find myself not in utopia but dystopia. There is no space; there is no silence. All inventions have been invented and recombination replaces creation. I fight the void. I become incapable of representing my current experience except through things that already exist. I dredge the archives seeking new meaning through new combinations. A rapid rhythm of change accelerates as I move through the limited number of combinations. Empty space is filled up. I consume all. Signifiers fail to link into coherent wholes. I pile up the appropriated fragments ceaselessly and empty them of their significance. The promise of new meaning evades me. The narrative stands still. Reality becomes that which is defined by media. Life is subordinate to the laws of the market. High and low culture merge. I sense loss and I drink Diet Coke like a dog gets excited about going for a walk ON A LEASH. As I am assimilated, I assimilate. I find myself in the present where a strange sense of continuity yet materializes. What appears disconnected connects. Information and experiences are absorbed. I bring them into myself. Distill them. Discard what does not fit. They become my own. This bioaccumulation of all that I have ingested, both toxic and nontoxic, has formed my current state of being. The last three years of accretion have snapped into clarity this being. The bulk of this assimilated data and change results from my immersion in 20th century art, research and collaborative analysis of design, experiments in painting and sculpture, and acceptance. My initial studies in 20th century design and art were purely academic, the laying of a foundation. Impressionism. Futurism. Dada. Surrealism. As my studies progressed to the more contemporary, I found myself unable to simply respond to those works intellectually. I was compelled to make, and make is what I did. My first bastardization, a Pollock-de Kooning in under 5 minutes. Bad painting, combines, first generation feminism. Fast, freely. Pink—discovered spontaneously. House paint flying everywhere. Ruined pants. Ruined shirts. Ruined shoes. The sacredness of art demystified. It was OK to make bad art. I didn’t have to make something beautiful or meaningful. I just had to make. And I did. Making good. Making bad. Making. Concerned design professors averted their eyes from the accumulating pile of paintings in my small studio space. The frenzy was great. Occasionally I would look up to see that my studio mates had joined me in pushing paint. The internal changing, the tide that I was unable or unwilling to divert, culminated with my exposure to abstract expressionism and the movements which followed immediately on its heels. The works resonated with me. A gnawing to move into the third dimension began. The questions about self, life, and culture could be explored in these visual languages I was discovering. What is black? What is white? How is it that my own goodness gets lost in my shadow? Robert Rauschenberg’s black and white painting series and his combines embedded with everyday objects brought out my own inclination toward darkness and light. Eva Hesse’s explorations in abstracted expression and minimal form via industrial materials created an urgency within me to work with similar materials in a tactile manner. Louise Bourgeois showed me how to use abstracted forms as expressions of self with undercurrents of cultural communal beliefs and emotions where self and society could be interchangeable. Physicality compounded by weight and size of Richard Serra’s monumental sculptures spoke to the significance of mass and space. Concurrent with these artists, Mother Teresa was working with the poorest of the poor dying on the streets of Calcutta. She bestowed dignity on the discarded, ruined, and social outcast collected from the street. In a feeble gesture of redemption, I found myself collecting discarded objects, cherishing them, and embedding them in my work. Elements of Abstract Expressionism, Minimalism, Post-Minimalism, Bad Painting, First Generation Feminism had been absorbed. Greenburg, Rauschenberg, Bourgeois, Serra and EVA HESSE assimilated. Ideas of the serial, field painting, experimentation with industrial materials, found objects, and a black and white painting series had been planted within me. But more importantly I found passion. And I liked it. Experiential to theoretical. Plodding through dense texts of 20th century literary, cultural, art and design theory, I find rereading required. Dissection. Backtracking. Vast amounts of time consumed. Circular and convoluted logic slides through my clenching fists. Slow torturous grasping. An inkling of understanding finally emerges with visions of theory overlaying culture. Theory and culture weave together. Sheer fascination. Gathering with studio mates, we push and pull this woven theory/culture image into something coherent—attempting to make it reproducible within two dimensions. Fiery conversations pursued. Culture. Truth. Value. The instant. The wanting. The flatness of a world made small by speed. Mixed ideologies crash. Peaceful co-existence abides. RAYification. EDIfication. Finally Kathified. An original thought acquired. DAMN. Original thought collectively discarded as NOT original. AGAIN. Design professors encourage, REQUIRE, DEMAND, FORCE, me off the computer. Command Z no longer an option. Unexpected paths filled with delight. Thanks Fiona McGettigan. Delight becomes overshadowed by analysis. Analysis consumes all [studio time]. Image making occurs in the periphery. The intellect elevated above all. Struggle to appear smart. Provocative. Hard work. Tired. Incredible stress. Unmerciful pressure. Self induced? Probably. Do it right. Make it right. Design. Redesign. Meaning altered. Backtrack. Move forward. Print. Scratch. Start over. Crap. You sunk my battleship. Amazingly, I walk away with a sense of wonder and pleasure in research based work and collaboration. I will not be able to discard these acts of research or the intellectual sharpening that comes with collective critical analysis. I have come to hunger for it. And I see that extruded through these theories and scrutiny, my work improves. The work has become dominated with interpretations of consumptive patterns and critique of the socially constructed self. This, I actually do like. Becoming bête comme un peintre six straight hours every Wednesday for three months. Naked model. My arm seeks across the page. Brain tires. Arm sags. I prop it up with the other. Finally the deadening weight is too great. Grease pencil shifted to recessive hand. Brain shuts off. Only sense of sight and touch remain intact. Searching lines find form. Tactile pleasure. Naked form appeals. Direction unsure. Design questioned. Luis Jimenez strokes ego. I spend a month in San Miguel Allende studying the form alongside artists Margaritte Dawit and Nacho, her husband. Returning, I continue my figure studies. Artery. Art League. Direction remains unresolved. Ego stroking no longer required. Line to mass. Clay working between my fingers, additive and subtractive processes of sculpture experienced. Three-dimensional form making. Innate? Possibly. Materials explored. Tremendous sensual pleasure derived. Paul Kittelson, in passing, suggests jumping ship from design to sculpture. 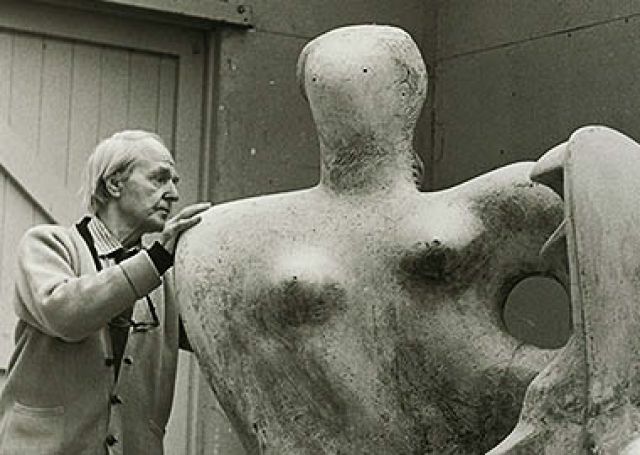 Figure studies, design research, and sculptural processes begin informing one another. Eva Hesse inspires. Direction unknown. Hunger. I cut classes and go to Europe. For three weeks, I am alone with myself drifting through the city [Roma, Firenza, Paris]. Wandering. The spectacle of the pope’s carcass avoided during the week of his funeral. Ten hours a day of meandering back passages. Slipping in and out of all contemporary art exhibits and museums that I stumble upon. Munch. Emilio Greco. Rodin. Picasso. Hesse and her contemporaries. I climb through the habitrail of the Centre Georges Pompidou in Paris. Explore the vaulted caverns of the Picasso museum. Am astounded by the sculptures. I experience first hand the works I had only viewed and mimicked from afar. More drifting. Do I draw what I see? No. Do I paint my response? No. Design? No. For the most part I speak to no one. I devour Guy Debord’s The Society of the Spectacle over arugala salad, a croissant and hot tea.6 Aimless I continue drifting. Like Walter Benjamin, I lose myself in the city. I smell the air, dry, dusty and old. Feel the sun full on my cheeks and the chill drafting through my jacket. Evening descends, I return to the four walls of my hotel room. It takes three days of this to become comfortable in each space. Yet still I do not draw, design, or paint what I see. Illuminated by a single lamp in the darkened room, I sit alone at the little desk in front of the hotel mirror thinking and writing. What comes out is not about these spaces. It is me. It is the past three years. Distillation occurs against this alternate backdrop. I am designer. I AM ARTIST. Sigh of relief. Acceptance.